So I was talking to a dairy farmer the other day and he was asking if we have had too much rain because he couldn’t get a number of chores done until it dried out some. I said not too much yet but we sure could use some sun. It has been a long time since we have had a really wet spring, the kind where you have water standing in the fields and you wait for weeks to get anything done. Back in the late 80’s and early 90’s we had a number of years when it rained like hell, particularly in early spring, and we many times wondered if we were ever going to get anything planted or weeded. This is when we developed our system of raising our beds up the fall before so they would drain and warm up fast come spring and heavy rains. 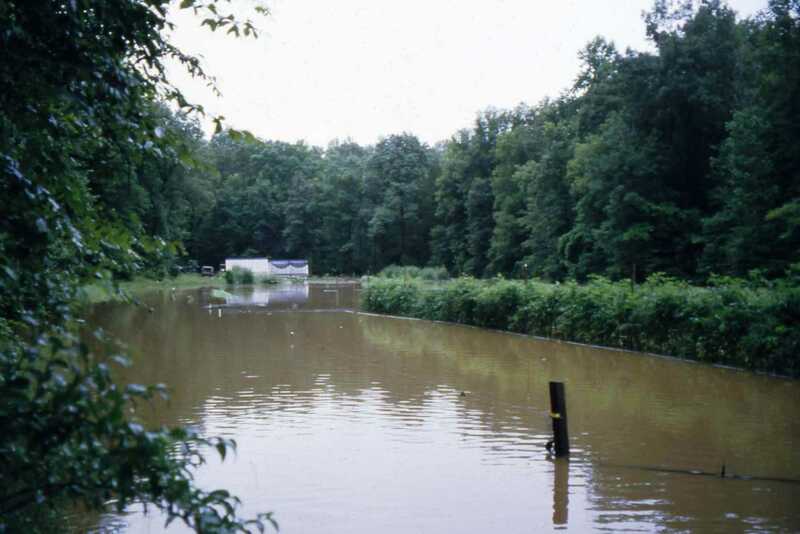 We even had a number of floods in our creek bottom field that finally made us stop using those fields (even though it is the best soil on the farm) in the regular rotation because we couldn’t afford to lose crops, then after Hurricane Fran in 1996 the tap turned off. We can’t remember a flood in the bottom since Fran and have slowly begun using that field on a more regular basis but still not for our major crops: lettuce, peppers and tomatoes. They are way up on the hill, safe from high water but certainly not immune to multiple other kinds of plagues that could hit them. As I always point out to new farmers, bad things will happen but you can learn a lot from those situations. One of our graduates, who is now farming a beautiful farm on the banks of the Cane river north of Asheville, had a huge flood this week which carried off not only much of what he had planted for this spring but a lot of his topsoil as well, replacing it with river rocks. He will lose the use of that area for some time to come but is planning on picking up all the rocks he can to start the process. The reason that creek bottom fields have rich soil is the same reason they flood, sometimes there is too much water and the stream deposits it there. So the answer to the dairy farmer is no we haven’t hand too much rain here but lots of other folks have, wish we could go help pick rocks. Come on sun! Plenty of blue and yellow Dutch Iris. Bachelors Buttons and Sweet William. Yellow Asiatic Lilies too. A few more things opening this week, probably some bouquets for market. We will be light on lettuce due to the overcast weather, the new Little Gem a sweet bibb type and very tender Oakleaf in green and red too. The new crop of Lacinato or Dinosaur Kale, really beautiful. More Broccoli Raab. Plenty of Easter Egg Radishes, Red Radishes and some Shunkyo Chinese spicy ones too. Spinach is back with a new planting. Lots of beautiful Japanese Turnips. Dill and Italian Parsley.